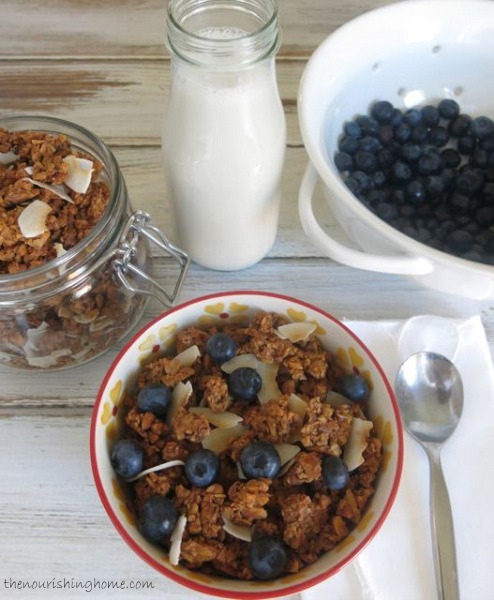 One crunchy bite is all it takes to become completely smitten with this grain free granola. Its slightly sweet cinnamony flavor with rich vanilla undertones combines beautifully with crisp toasted coconut and your favorite fresh or dried fruit. It’s perfect with a splash of almond milk, or as a topping for yogurt parfaits and ice cream. Since going grain-free, I’ve slowly been finding new ways to make old favorites. And since my gluten-free granola is a tough act to follow, it’s been slow going to find a grain-free way to capture the crunchy, yet chewy texture of oats and ensure the formation of sweet cereal clusters. But I was up for the challenge! Rather than boring you with the details of recipe development, I’ll jump straight to the punchline … Eureka! I’m beaming (and thanking the Lord) for the wonderful victory in achieving a grain free granola that is so close to my soaked oats version that I can now honestly say, I don’t miss those oats at all. And I’m betting you won’t either! 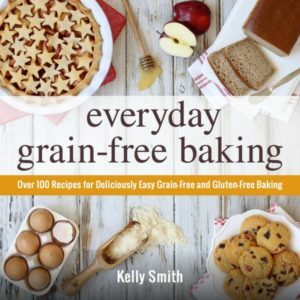 This delightful recipe is just one of more than 100 irresistible grain-free, dairy-free recipes in my new cookbook – Everyday Grain-Free Baking! Place the nuts and salt in a large bowl. Cover with warm filtered water so that the water level is at least two inches above the nuts. Cover the bowl with a plate or clean kitchen towel, and allow the nuts to soak 18-24 hours. 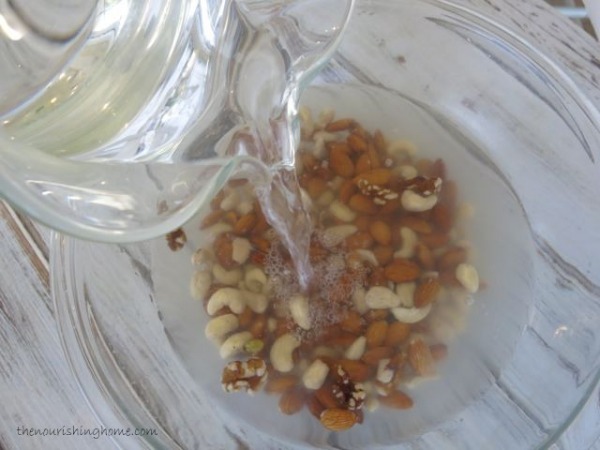 When soaking time is completed, drain and rinse nuts. Place on a clean kitchen towel to absorb excess moisture. In a large bowl, whisk together the softened coconut butter and honey until smooth and creamy. Then add the remaining ingredients (vanilla, cinnamon, coconut flour and salt). Whisk until well combined; set aside. Add the finely chopped nuts to the bowl with the honey mixture. Once all nuts are processed, use a rubber spatula to fold them into the honey mixture until well combined. Preheat oven to 210°F. Line a 12x17-inch rimmed baking sheet with parchment paper. 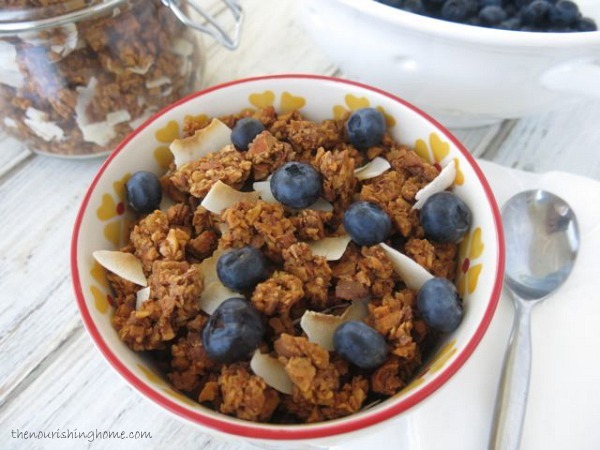 Spoon grain-free granola mixture onto the parchment-lined baking sheet. 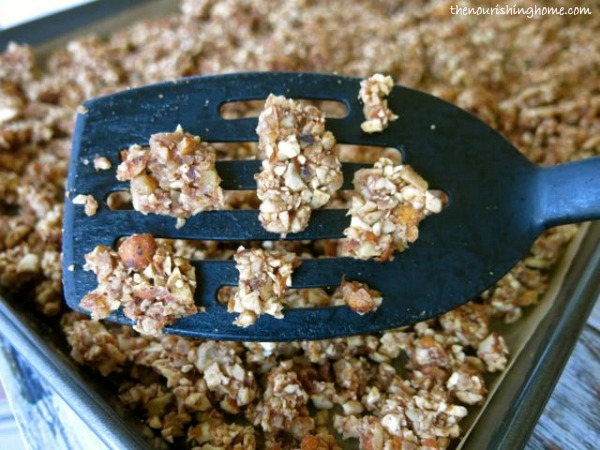 Use an angled spatula to evenly spread out the granola across the pan into a thin layer. Bake granola for two hours at 210°F. Then remove the baking sheet and gently flip over the granola, section by section, Use the top of your spatula to gently separate any large pieces into small cereal clusters. Return granola to the oven and bake another two hours. 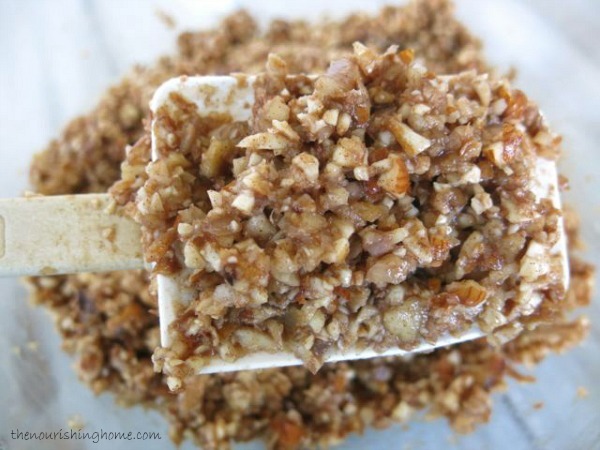 Then remove and use the spatula to again turn and gently stir the granola. Sprinkle top with unsweetened coconut flakes . 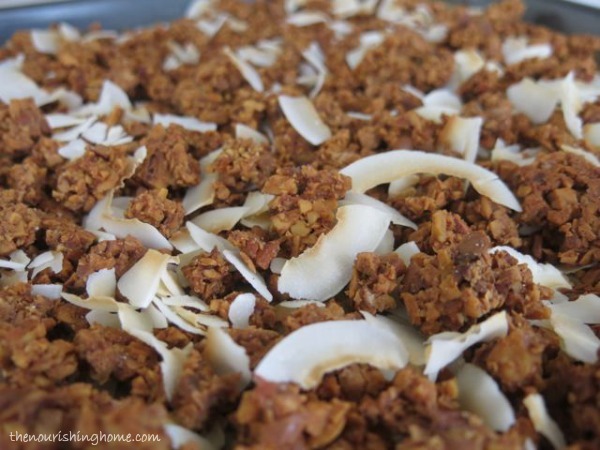 Return granola to the oven and bake another 30-45 minutes, until coconut is slightly toasted. Turn off the oven. Place baking sheet on the stovetop to cool. After about 5-8 minutes, check the granola for the crunch-factor. If it's crunchy enough for you, allow it to continue cooling. If it isn't crunchy enough, return it to the warm oven and allow it to sit in the warm oven for 20-30 minutes more. Remove from oven and allow the granola to cool again on stovetop 5-8 minutes and again check the crunch-factor. 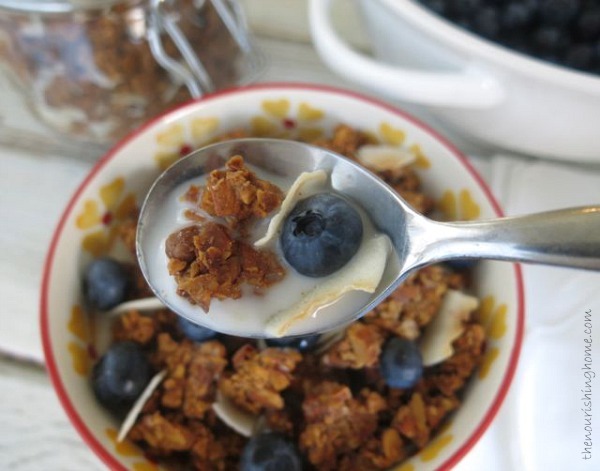 When granola is crunchy enough for you, allow it to completely cool about 30 minutes. (Please note: The granola will become crunchier the cooler it is.) Then immediately transfer it to mason jars (or other airtight containers). Store in the pantry for up to two weeks or in the fridge or freezer for up to a month. Enjoy with your favorite mix-ins such as fresh or dried fruit. Or use it as a topping for yogurt parfaits or over ice cream. See How It's Done: Remember to check out the photo tutorial following this recipe. * Coconut Butter Substitution: In anticipation of the question about how to substitute the coconut butter called for in this recipe, you can replace the coconut butter with 3 tbsp of coconut oil (or softened butter), but the results (although tasty) are just not the same, since coconut butter gives the granola a deep rich flavor and provides an especially nice crunch without a heavy coconut taste or oily texture. So, I really recommend making a small invest in a jar of pure coconut butter . It is truly delicious, which is why you'll be seeing it in many more recipes to come, such as my dairy-free cookie icing. Place the nuts and salt in a large bowl. Cover with warm filtered water so that the water level is at least two inches above the nuts. Cover the bowl and soak 18-24 hours. In a large bowl, whisk together softened coconut butter and honey until smooth and creamy. Then add the remaining ingredients (vanilla, cinnamon, coconut flour and salt). Whisk until well combined; set aside. Once all nuts are processed, use a rubber spatula to fold them into the honey mixture until well combined. Preheat oven to 210°F. Line a 12×17-inch rimmed baking sheet with parchment paper. 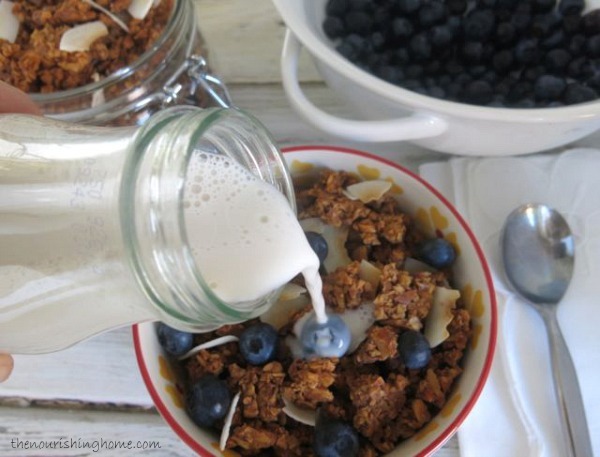 Spoon grain-free granola mixture onto the parchment-lined baking sheet. 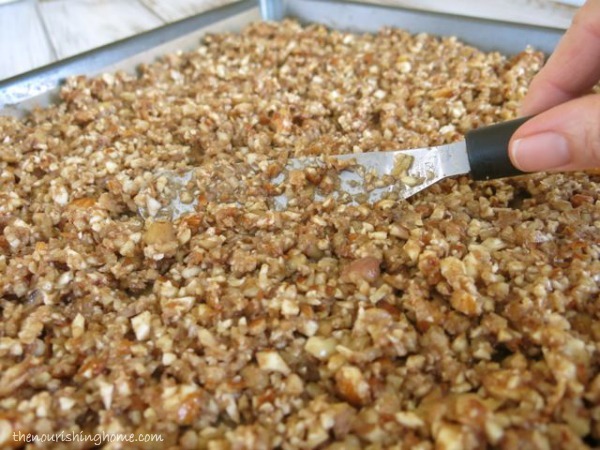 Use an angled spatula to evenly spread out the granola across the pan into a thin layer. Bake granola according recipe instructions, gently turning the granola as outlined in the recipe above. Do not over mix, as you simply want to gently divide the mixture into small cereal clusters as shown above. Sprinkle top with unsweetened coconut flakes, and continue baking per the recipe instructions above. The granola is ready when the coconut is lightly toasted and the granola reaches desired level of crunchiness. Enjoy with your favorite mix-ins such as fresh or dried fruit and a splash of milk. Absolutely delightful! This looks so so good! I’m always looking for a granola to have handy for busy mornings. Making this tonight. Thank you. Wow. That looks yummy. I’m going to have to check my pantry and start that today. Just an FYI-you are saving me in so many ways. Doc took me off gluten in November due to hormone/thyroid problems, and I’m so glad I had already found/loved your blog and dabbled with GF recipes. It has been an interesting mindshift/learning curve, but I’m so glad to have your blog as a go to for encouragement and tasty meals to boot. Now…If I can just get that 2-week meal plan going and stick to it. :0? This looks really delicious. I gave up cold cereals when I first read “Nourishing Traditions” a number of years ago. I’ve made ‘nutola’ a few times and it is good, but not baked and not quite the same. I’m definitely going to try this recipe. I have read many places that you should not soak cashews for longer than 6 hours I think. Do you have any problem with them turning slimy or anything when soaking them 18-24 hours? LOL – love that! I’m sharing via social media later today! HUGS!! You are a genius! This granola is amazing. Thank you for the recipe! Hi Kelly! So, I’ve got my granola all ready to bake and I just now noticed the four hour bake time! Should have read through the recipe completely. It is already 7:30pm and I am not likely to stay up to roast tonight. Is it ok to wait till morning to bake it if I keep the mix covered overnight? I covered the mix and waited until the next day to bake and it turned out perfectly. It’s delicious! Thank you! Yay! So glad it works out. Good to know should I or another reader run into this same issue! 🙂 Thanks, Hilary! Just made this. LOVED it. I had it on my homemade Greek Yogurt and it was yummylicious. Some modifications I made…I don’t care for the fructose rush of honey (I usually use Really Raw Honey) so I used a volume of water equal to the honey with 1 Tablespoon of my preferred sweetener (Sweet Blend from Trim Healthy Mama- a blend of Erythritol and Stevia). I also didn’t quite have the full cup of walnuts so I finished the measurement with raw sunflower seeds. Everything else I did as written. It came out great! One just needs to plan ahead for soaking and the long low temp cook time. 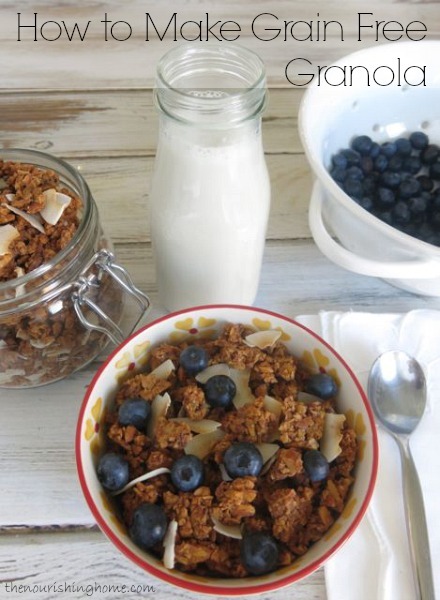 Thank you for sharing a truly healthy granola recipe! I was hoping to make these for an event tomorrow. 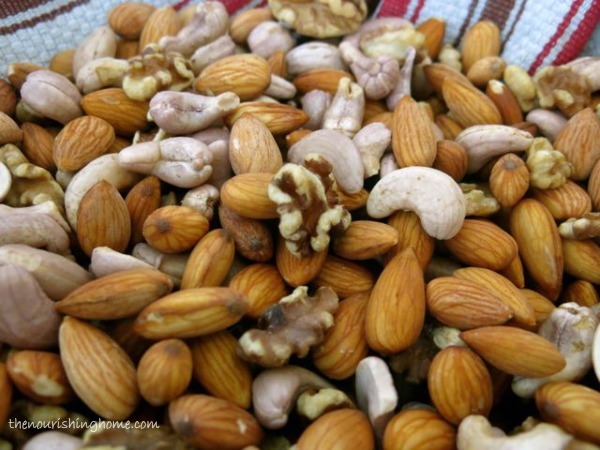 Can I decrease my soak time on the nuts to 4-5 hrs so that I have time to make them? P.S. 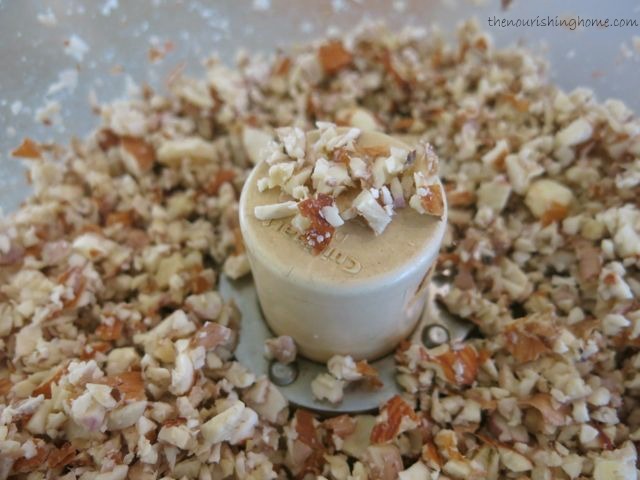 If you opt to not soak the nuts, it will impact the cooking time and it will be more crumbly. So I do recommend soaking the nuts at least for 4 hours. And also, if you opt not to soak at all then be sure to decrease the cook time (checking granola more frequently) since it will cook faster since there will not be as much moisture in the mixture. Hope this helps! 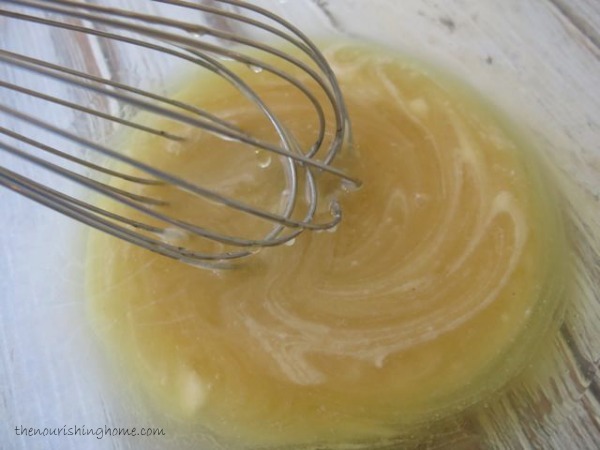 Kelly – is coconut butter the same as coconut cream from Tropical Traditions? Just discovered your blog when googling grain-free granola. This looks so good, and am hoping to try it out this weekend. But I don’t have coconut butter. Do you know offhand whether this will work with coconut oil? Looking forward to checking out the rest of your recipes! Hi, Dr. Deb. Welcome, to The Nourishing Home. I’m so glad you found us here. Please be sure to check out our free GF whole food meal plans in the meal planning section of the site too! To answer your question: Yes, you can use coconut oil, but I would only use 2-3 tbsp since it doesn’t have the same consistency as coconut butter. Or if you are not dairy-free you could substitute with 2-3 tbsp grassfed butter. I will tell you that the coconut butter really gives this a wonderful taste and texture. So definitely give it a try again when you can get some coconut butter. You can use coconut butter to create some pretty amazing frostings as well as other delicious desserts. this is amazing!! can i use less mapple syrup? and also i have a small oven and when i did the first time, it got burn so quickly. should i lower the degrees? Just come across your site and I love it! I’ve recently started my own healthy food blog and hope it will be as impressive and delicious as yours. 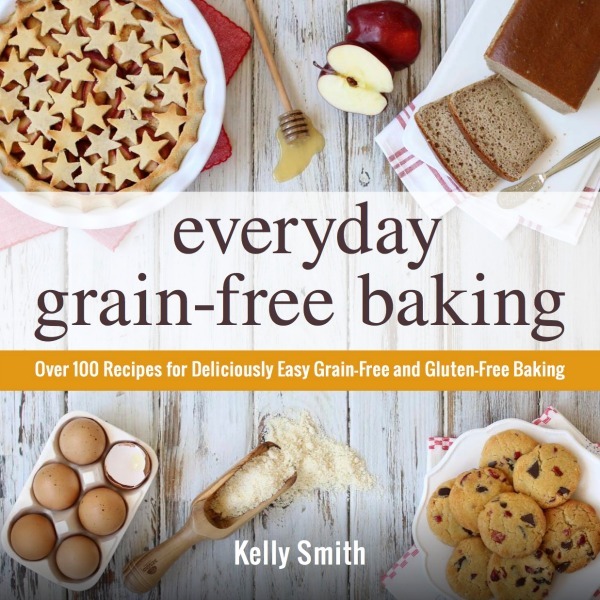 I will definitely be trying some of your recipes and think I need to invest in your book! Hi, Stef. I’m so sorry I missed your comment. Please forgive me for the oversight. Thanks so much for taking the time to leave a kind note. I’m so happy you’re enjoying the recipes here. Blessings to you for a Happy & Healthy New Year! Thank you so much for this recipe! I’ve just finished soaking the nuts and am mixing together my sweetener. One thing- the recipe calls for 2 tbsp of vanilla extract… Surely that is supposed to say teaspoons? Hi there, is the temperature stated correct? I have just tried to make this and after less than 30 minutes half of it was burnt to a crisp. This is a very expensive recipe to get wrong so as you can imagine I am extremely disappointed. The temperature said 210 degrees. Is that degrees Celsius or farenheit? You have not made that clear. Thanks. Yes, assumed that it was Celsius. Thanks for the advice on the oven temp thing. My oven does run hot. Is it important to soak the nuts? I assume that you do this to reduce the phytic acid content to make the nutrients more bioavailable rather than as a necessary cooking step? Just wanted to clarify before diving in to try out the recipe. Hi Kelly–I am wondering if I can substitute a different nut for cashews? I cannot eat legumes and so cannot eat peanuts or cashews.